And so to the problems that face us, I wish to throw my own hypothesis into the ring. I’ve placed my reconstruction below today, and I welcome comments. I will gather my thoughts about the various arguments surrounding the epistle in a later post on another day, hopefully informed further by any helpful comments. I propose that there is a real letter of the church at Rome to the church at Corinth that addresses the problem of the couple of persons who have turned against the presbyters. In the middle of one argument in particular, that the believers in Jesus Christ are especially in danger of the risks of having prideful and envious thoughts that lead to death, there is an interpolation inserted based on a separate composition. The composition inserted seems easiest to understand if it is (non-Christian) Jewish with minimal glosses from the hand of the editor. The doxologies seem to be the editor’s because they appear in both parts. Besides his refrain of “world without end” and “amen,” the editor seems to hold consistent to describing Jesus as a “high priest,” something found in the doxologies and some of the possible glosses. The interpolation starts with some transitional words from the editor. The material is loosely related (by the word association of “pure mind”) to the original letter’s argument where it leaves off, but it soon begins to wander off according to the different aims of the source text. The editor also seems to have some minimal concern for continuity (with some word association regarding “knowledge”) when he abruptly picks up the original letter’s argument again, prefacing the statements about the necessity of orderly sacrifices in the Temple in the source to the conclusion of the original letter’s argument that the danger of death is greater for those to whom much knowledge is given. Despite the effort, the beginning and the end of the source quoted do not actually flow well into the substance of the original letter’s argument, which is seamless after the interpolation is removed. 3:1 All honour and enlargement was given to you, and then was fulfilled that which is written: — The beloved ate and drank, and was enlarged and grew fat and kicked. the word of God, with the full persuasion of the Holy Spirit, went forth preaching the good tidings that the kingdom of God was at hand. they had proved them in the Spirit. place, saith in this wise: I will establish their bishops in righteousness, and their deacons in faith. 54:3 He who doeth this shall gain for himself great glory in the Lord, and every place shall receive him; for the earth is the Lord’s, and the fulness thereof. 62:2 For we have handled every argument concerning faith and repentance, and genuine love and temperance, and moderation and patience, reminding you that ye must by righteousness and truth and long-suffering approve yourselves with piety to almighty God, being of one mind, without malice, in love and peace with earnest obedience, even as our fathers, who were before mentioned, approved themselves with humility both with regard to God the Father and Creator and to all men. 22:1 All these things doth the faith which is in Christ assure. For he himself, through the Holy Spirit, thus calleth unto us: [Possibly, the hand of the editor.] Come, ye children, hearken unto me, I will teach you the fear of the Lord. 30:5 — doth he that is born of woman and liveth but for a short time think himself to be blessed? Be not abundant in speech. 32:2 For from Jacob came the priests and all the Levites that serve the altar of God. From him came our Lord Jesus Christ according to the flesh; [Possibly, the hand of the editor.] from him came the kings and rulers and governors of the tribe of Judah; and the remainder of his tribes are of no small glory, since God hath promised, Thy seed shall be as the stars of heaven. 33:1 What, then, shall we do, brethren? Shall we cease from well-doing, and abandon charity? May the Master never allow that this should happen to us! but let us rather with diligence and zeal hasten to fulfill every good work. 35:2 — life in immortality, cheerfulness in righteousness, truth in liberty, faith in confidence, temperance in sanctification; and all these things have already come within our cognizance. 38:1 Let, therefore, our whole body be saved in Christ Jesus [possibly, the hand of the editor], and let each be subject to his neighbour, according to the gift which he hath received. As I said, I will write more about this, but as of now I’m opening the idea here up to comments. Peter, it would have help if you posted the whole letter, with what you think was original in normal characters, and what you think are later interpolations in bold or italics. Isn’t that basically what I have done? I think your analysis is most likely correct in its main part. Yes it looks 22:1 to 41:2 is mostly a Jewish text, which does not fit well with the rest of the epistle. This seems to have been written before the fall of Jerusalem (41:2) and the author was then Jewish (29:1-30:2, 40:1-41:2, etc.). However 36:2-37:1 includes, in the same sequence, four elements found in Hebrews 1:4-13. And because “his Son” in 1 Cle 36:4 comes out-of-the blue, unexplained earlier, I think that 1 Clement passage was written with knowledge of the Christian epistle ‘Hebrews’. So it might be a Christian inclusion by the so-called editor. Note: 24:1-27:3 is not about the Resurrection, but future expected resurrections (24:5, 26:3). Because the overall style of the so-called interpolation seems not different to the rest of the epistle, I think 22:1-41:2 was written by the same author who wrote the Christian part of the epistle (by then the author had become Christian. His Jewish origin would explain the fondness of the author for Jewish Scriptures, even in the Christian parts of the epistle). He lightly Christianized the so-called (Jewish) interpolation (including 36:2-37:1 and other bits), with some doxology material (“the world without end”) for sake of homogenization. This is a great idea, Peter, and pairs well with the idea that Clement of Rome may have been the same person as Flavius Clemens, who was put to death for “atheism, a charge on which many others who drifted into Jewish ways were condemned” (Cassius Dio Rom. Hist. 67.14). Perhaps the older “Jewish” part of 1 Clement, like so many other Jewish Intertestamental writings, was later Christianized. 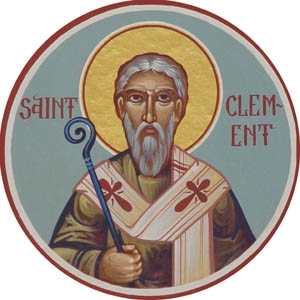 I was already leaning towards the idea that Clement of Rome was Flavius Clemens for other reasons, so your post makes a lot of sense in this light. In the larger picture, I’m really enjoying your blog.